Try out this always successful, laughter-generating, team building icebreaker. It’s a good icebreaker for a meeting because it takes so little time yet gives you the exact results that you require from a team building icebreaker. It also produces great results for the facilitator. Your attendees pay you back with the warmth that their conversation generates. Not even the shyest participant is wary about finding what he or she has in common with the other people in the group. Conversations tend to concentrate on items external to the employee. 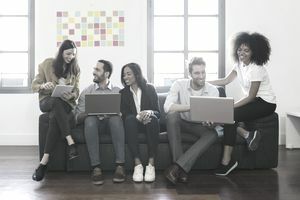 Consequently, employees are able to relate and share without feeling as if the group conversation is too personal or invasive. This has a positive effect on the interaction of the group members. Divide the meeting participants into groups of four or five people by having them number off. (You do this because people generally begin a meeting by sitting with the people they already know best, especially their closest coworkers and people from their departments. It's a natural comfort zone thing.) One of the key expectations for any icebreaker that you offer is to help people from different departments get to know each other. This helps you build more effective teams and reinforces camaraderie and cooperation across departments. In a public meeting, you want to foster the same goodwill in the group so that the conversation flows freely throughout the day. When attendees start by finding commonalities, no matter the attendee's group assignment, he or she is comfortable participating. Tell the group to find the ten things that they have in common with the other people at their table. Groups take no more than ten or fifteen minutes to do the exercise from experience using this team building icebreaker. Tell the groups that one person must take notes and be ready to read the group's list of ten commonalities to the whole group upon completion of the assignment. Ask for a volunteer to read their group's whole list of things in common first. (This works better than having the facilitator select the first group to share as it does not take any employee out of their comfort zone. The first group sharing their list volunteered. Then, ask the other notetakers, in turn, to share their group's whole list of commonalities with the whole group. Because people are your best source of laughter and fun, the reading of the lists always generates a lot of laughter and discussion. Attendees also enjoy finding one of their ten things in common on another group's list of things in common, too. You can also catch the drift of the conversations that took place in the small groups based on the transitions made from item to item. Participants love to compare their list of items with the lists generated in the other small groups. You will want to allow a free flow of conversation, laughter, and sharing. Your audience really is your best resource for making this icebreaker a fun part of your training, meeting, or team building event. This team building icebreaker takes 10-15 minutes, depending on the number of groups. To keep the activity ​down to ten minutes, after seven minutes of brainstorming together, tell the groups that the lists that they have created are perfect, no matter how many items they have on their list. Then, debrief the activity. You don't want to make the rest of the participants wait with their eyes focused on the slower groups—waiting. This also makes it harder for the already slow groups to finish because they become self-conscious and squirmy when all eyes are on them. This is not good for building camaraderie and a sense of group cohesion. This is a tip for any meeting. You will frequently have a group or two that is slower than the others and this is a way to address this issue.